Spiral arms seem to be trailing arms, but this is very hard to determine. In some rare cases, spiral arms may lead. Spiral arms are sites of strong star formation: we see dust, HII regions, blue stars, lots of gas. In fact, spiral arms are much more prominant in blue light than in red. 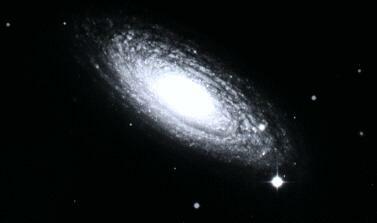 Here's a morphing movie of the spiral galaxy M81 showing how the appearance of the spiral arms change with wavelength. But what are they? How do they form? How long do they last? Spiral rotation curves are not"solid body" rotation curves. What would a solid body rotation curve look like? Spiral rotation curves are flat: Vc ~ constant. Therefore the angular rotation rate goes like Vc/r, so that the outer edge takes longer to complete an orbit than the inner regions. Well, that's okay, it looks like a spiral pattern, what's wrong with that? It happens too fast. It happens in a few rotation periods (say, half a billion years). The age of the Universe is something like 10-15 billion years -- if spirals made their arms this way, they should all be so tightly wrapped we wouldn't see them as spiral arms anymore! So spiral arms can't be physical objects. What else could they be? Imagine driving down the freeway, and there are a couple of grannies in their cars doing 40mph in both lanes. There's a big traffic jam behind them. You zoom up behind them doing 60 mph, then hit the jam. You slow down to 40 and carefully work your way through the jam. Once you pass the grannies you speed back up to 60 mph. Everybody else is doing the same thing. So we have a situation where the traffic jam moves along at 40 mph, while the cars on the highway are typically going 60 mph. This is an example of a density wave, a density perturbation which moves along at a speed different from the speed of the objects within it. How does this apply to galaxies? Imagine the spiral pattern is a density wave. It rotates through the galaxy at a fixed angular speed, called the pattern speed. In the inner parts of the galaxies, stars are moving faster than the pattern speed, and overtake the density wave (like you passing the grannies). In the outer parts of the galaxies, stars move more slowly than the pattern speed, and the spiral arms overtake the stars. What happens when a star encounters the density wave? As it nears the wave, it speeds up towards the density wave. Why? After it passes through the wave, it slows down and leaves very slowly. Why? So the star spends more time around the density wave than it otherwise would. 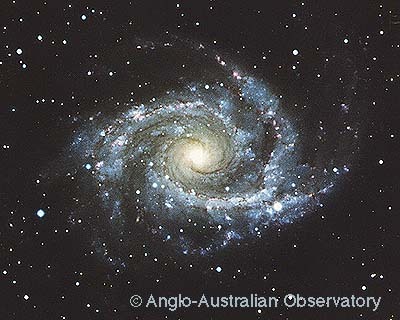 We see this as an enhanced density of stars -- a spiral arm! How does this help us with the winding problem? This can't be the whole story, though. Why is there so much more star formation in spiral arms? One idea: as gas clouds move into the density wave, the local mass density increases. Since the criteria for cloud collapse ( the Jeans instability) depends on density, a higher density makes it more likely for clouds to collapse and form stars. Another idea: as clouds get swept up by the spiral arms, they collide with one another and drive shock waves through the gas, which in turn causes the gas to collapse and form stars. But what causes the density wave??? Something has to "seed" this perturbation. Once it is seeded, the self-gravity of the disk will amplify the perturbation and make it grow. In our own galaxy, the spiral arms may be excited by a complex interaction between our companion galaxies the Large and Small Magellenic Clouds, our dark matter halo, and the disk of our Galaxy. This is not well understood, though.